Who Invented The Battery? History Of Battery - Biography of Alessandro Volta. Battery Seal Inventor - Alessandro Volta. Alessandro Giuseppe Antonio Anastasio Gerolamo Umberto Volta (born Como, Land of Duke Milan, (now Italy), 18 February 1745 - died in Como, Lombardi-Venetia, (now Italy), March 5, 1827 at the age of 82 years) is a physicist Italy. It is primarily known for developing batteries in 1800. 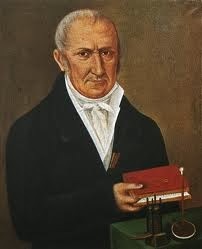 Alessandro Volta is an Italian physicist, chemist, prince, professor, author, inventor of some useful objects such as: Battery element or Volta pile (1800), inventor of condenser, eudimeter, , and air lights. It improves electrophorus (1777) and electroscope. He discovered and isolated methane gas (1778). Volta is the son of a nobleman, his brother there are 9 people who all enter the monastery, except Volta. Volta can only speak at the age of 4, until his family thinks that Volta is an underdeveloped child. But after the big he can match his peers. The 14-year-old firmly says he wants to become a physicist. He became a physics teacher at the age of 29 at Como High School. He found electrophicus; ie a tool for generating electric charge by induction path. This tool consists of two metal plates; first plate and second plate. The first plate is covered by ebonite, the second plate is insulated voltage. The first plate is rubbed and electrically loaded negatively. If the second plate is placed on top of it, the positive electric charge is attracted to the lower surface. Negative charge is driven upward. The negative charge is then drawn to the ground. This process is repeated many times until there is a strong charge on the second plate. This charge collecting machine is the base of the capacitor or capacitor until now. Volta became famous and he was appointed professor at the University of Pavia. Here he made a device associated with static electricity, consequently he was appointed a member of the Royal Society and awarded a Copley Medal. In 1786 Luigi Galvani, physiologist and friend of Volta, discovered that the frog's legs were attached to a copper hook, when it touched iron, (the leg) throbbed. Galvani concluded that frog meat contains electricity. Eight years later (1794) Volta knew that the electricity came from metal and not from frog meat. He continued Luigi's work and proved that Galvani's theory of the frog's toe shock was wrong. In fact, this effect arises from two unlike metals from the Galvani scalpel. There was a scientific debate between Volta and Galvani followers for 6 years. Based on his opinion, Volta successfully created Voltaic Batteries (Voltac Pile). Year 1800 Volta ber-finding battery. Then the Galvani theory fell. For his services, the electrical potential difference unit is named. 0 Response to "Who Invented The Battery? 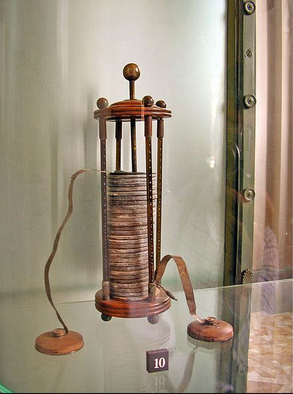 History Of Battery - Biography of Alessandro Volta"